Khairy (third right) speaking during the conference. With him are (from left) Layar assembly Gerald Rentap, Tasik Biru assemblyman Dato Henry Harry Jinep, Abdul Karim, Assistant Minister of Youth and Sports Datuk Snowdan Lawan and Telang Usan assemblyman Dennis Ngau. KUCHING: Youth and Sports Minister Khairy Jamaluddin has given his assurance that he will convey the state’s wish for a full-fledged sports school to Education Minister Datuk Seri Mahdzir Khalid. “It’s interesting because we don’t have to build a new school as there is already a school next to the sports complex in Petra Jaya,” he said in referring to SMK Demak Baru at Jalan Diplomatik here. 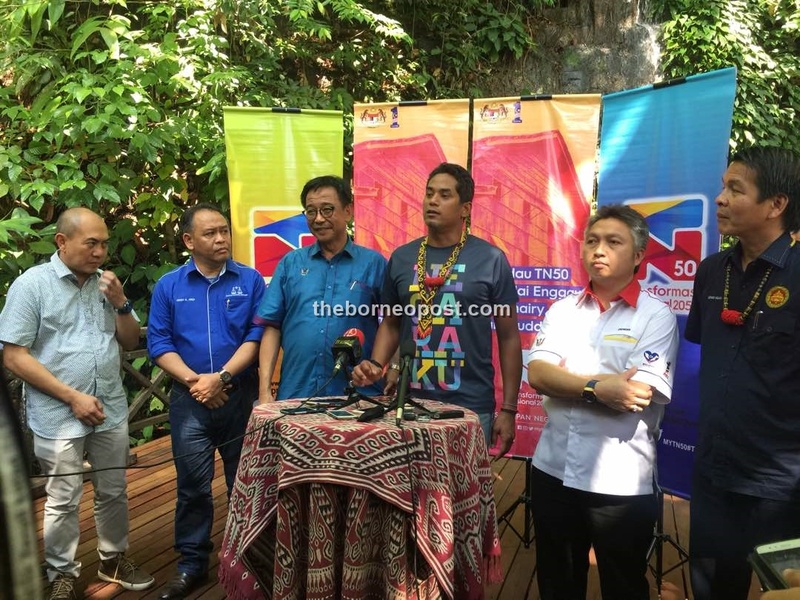 Speaking to reporters after attending the National Transformation 2050 (TN50) Dialogue Session with Sarawak Ethnic Youth Groups at Sarawak Cultural Village (SCV) near here today, Khairy stated that the secondary school can be converted into a sports school. “All that’s needed at the school premises is a hostel block in view that sports schools are residential schools. “If we can do that, then the curriculum can be changed to follow the sports science curriculum for Malaysia sports schools from the Ministry of Education and Ministry of Youth and Sports,” he explained. While he remained optimistic with the proposal, he nevertheless reiterated that he would have to discuss this with Mahdzir beforehand. Earlier this month, Abdul Karim had expressed his dream to see the establishment of a sports school in Sarawak become a reality so as to produce high quality state athletes.